FILE PHOTO: Student leaders Nathan Law and Joshua Wong arrive at the High Court to face verdict on charges relating to the 2014 pro-democracy Umbrella Movement, also known as Occupy Central protests, in Hong Kong, China August 17, 2017. 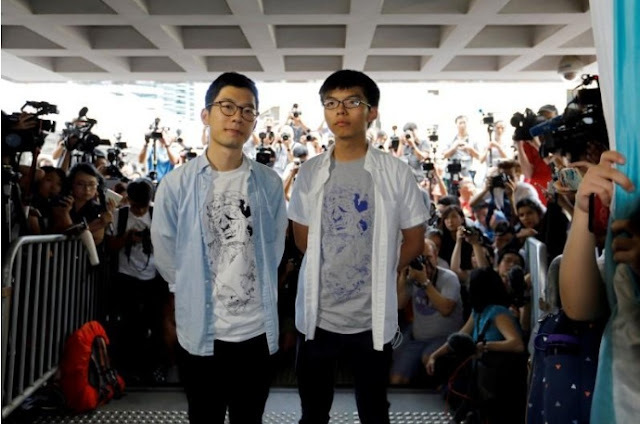 HONG KONG - Hong Kong’s highest court granted bail to two prominent young pro-democracy activists, Joshua Wong and Nathan Law, on Tuesday pending an appeal over their jail terms for unlawful assembly linked to the city’s mass pro-democracy protests in 2014. Hong Kong’s appeals court jailed Wong, 21, Law, 24 and Alex Chow, 27, leaders of the Chinese-ruled city’s democracy movement, in August. Their sentencing came as a blow to the youth-led push for universal suffrage and prompted accusations of political interference. Hong Kong has been governed under a “one country, two systems” formula since its return from British to Chinese rule in 1997, allowing freedoms not enjoyed on mainland China that include an independent judiciary. Hong Kong Chief Justice Geoffrey Ma, who heads the Court of Final Appeal, granted Wong and Law bail of HK$50,000 ($6,408) each while they appeal against their respective six-month and eight-month jail terms. “There’s no flight risk,” Ma told the court. Chow did not apply for bail. Ma said a Court of Final Appeal hearing would be held on Nov. 7 to consider the trio’s applications for appeal. The next legal steps will likely be scrutinised closely, with the jailings having shaken confidence in Hong Kong’s vaunted rule of law. A group of senior international lawyers recently issued a joint letter saying the jailings posed a serious threat to the city’s rule of law. Hong Kong’s highest court granted bail to two prominent young pro-democracy activists, Joshua Wong and Nathan Law, on Tuesday pending an appeal over their jail terms for unlawful assembly linked to the city’s mass pro-democracy protests in 2014. Hong Kong’s appeals court jailed Wong, 21, Law, 24 and Alex Chow, 27, leaders of the Chinese-ruled city’s democracy movement, in August. Their sentencing came as a blow to the youth-led push for universal suffrage and prompted accusations of political interference.